Most of what is known about plants and the K-T boundary in the Williston Basin region, as summarized in this section, comes specifically from the Marmarth area in the southwestern corner of North Dakota (Figure 6.4). It derives from our own research, Johnson on paleobotany and Nichols on palynology, mostly in collaborative studies on the Maastrichtian Hell Creek Formation and Paleocene lowermost part of the Fort Union Formation. The flora - both megaflora and palynoflora - of the Maastrichtian and Paleocene in this area has been thoroughly sampled and extensively studied, although much systematic work remains to be done on the megaflora. Paleobotanical and palynological results from this area incorporate physical evidence of the K-T boundary (the iridium abundance anomaly, shock-metamorphosed minerals, and spherules). Many of the paleobotanical and palynological collections are associated with intensively studied vertebrate fossils, and many of the measured sections from which the fossils came have also been analyzed paleomagnetically and geochemically. 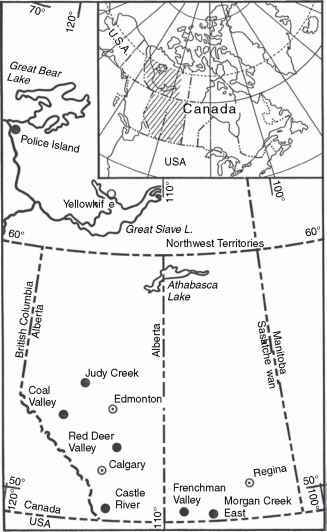 A comprehensive summary of all recent studies in the area is the Geological Society of America Special Paper 361 (Hartman et al. 2002). The plant fossil record is based on more than 160 leaf quarries and more than 350 individual microfossil samples (see Figure 6.5). Unusual for a paleobotanical study is the large number of megafossil specimens collected, more than 22 000. Plant microfossils, being so much smaller, are generally easier to collect in large numbers, yet few other studies in the field of palynology have involved an actual survey of some 700 000 specimens, as is true of the North Dakota K-T boundary study. The megafloral analysis is based on 380 morphotypes (species equivalents), and the palynofloral analysis involves about 110 systematically investigated taxa. Southwestern North Dakota is not where the first investigations of floral changes across the K-T boundary were conducted (see Section 7.2), but it is the area that has seen the most intensive study, and from which the most complete record of these changes comes. It is instructive to review the historical highlights of the development of the data and interpretations, focusing on work that was done in the 1980s in response to the Alvarez challenge.